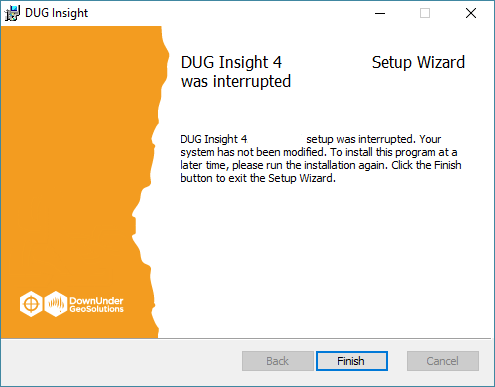 DUG Insight User ManualFrequently Asked QuestionsFrequently Asked Questions Insight Error MessagesInstallation of Insight failed! What should I do? If the installation of Insight is unsuccessful, the error message below will be displayed. This error could be due to a number of reasons. It would be a great help in diagnosing the problem if you could run the installer with extra logging enabled, as described below. This will create a log text file that will tell us exactly what was going on during the installation. Press Enter and run the installation again. The log file will document all activity by the installer, including the moment it failed and the error code. Send us a support ticket by emailing support@dugeo.com describing how and when the problem occurred, your system specifications, and attaching the log file. Prev: Display driver has stopped responding. What should I do?